Jupiter, Its Great Red Spot and Red Jr.
On September 20th, I took this picture of Jupiter with my little 3.5 inch Questar telescope and a ToUcam webcam. The South Equatorial Belt (SEB), which disappeared about 6 months ago, is still notably missing. 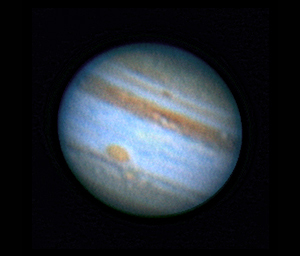 However, the Great Red Spot (GRS) is still there and clearly evident in this picture. It looks more orange than red, but no one is suggesting a name change. There is a similar spot slightly below and to the right of the GRS. It is called officially called Oval BA but many refer to it as Red Junior.